NORTH AUGUSTA, S.C.—A package deal laid the groundwork for Duke’s national championship run in 2015. If Harry Giles and Jayson Tatum, arguably the two best players in the recruiting class of 2016, join forces in college, a possibility they’ve discussed, their team would be considered the favorite to win it all. Now there could be a similar arrangement in the works at the top of the next class. 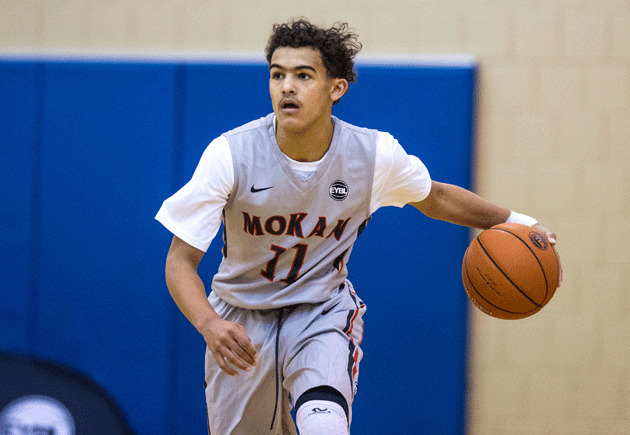 Michael Porter Jr. and Trae Young say they would like to play at the same school. If it happens, this package deal—if not quite rising to the level of a Jahlil Okafor-Tyus Jones pairing—would unite two of the nation’s top players at their respective positions. Porter, a small forward who attends Tolton Catholic (Mo.) High, is rated the No. 2 player in the class of 2017 by Rivals.com, while Young, a point guard at Norman North (Ok.) High, is rated No. 28 and could see his stock climb if he continues to acquit himself well against other heralded backcourt prospects. It helped that Young, who lives in Norman, Okla., joined Porter, who lives in Columbia, Mo., on the Kansas City-based grassroots team MOKAN Elite this spring, which allowed the two to develop a better feel for each other’s strengths and weaknesses. Basketball runs in the families of both players. Young’s father, Rayford, played at Texas Tech and then professionally in Portugal. Meanwhile, two of Porter’s sisters, Bri and Cierra, play on the Missouri women’s team for which his dad serves as an assistant, and the sister of Porter’s mother, Robin Pingeton, is the head coach of the team. In addition, Porter’s godfather is Washington men’s head coach Lorenzo Romar. Porter has long been considered a blue-chip talent, but Young saw his profile rise dramatically over the past few months. In 22 total games with MOKAN in the Elite Youth Basketball League this year, he averaged 18.6 points and 4.7 assists while shooting 35.6 percent from three-point range. The highlight of Young’s spring came during the second April live evaluation period. In a game against the St. Louis Eagles that was billed as a one-on-one matchup between Porter and Tatum, Young scored 29 points, grabbed five rebounds and dished out three assists. “It was a game where I opened a lot of people’s eyes,” Young says. By contrast, Porter had been on the radars of many coaches and recruiting analysts for a long time. He’d already received multiple scholarship offers by the spring of his freshman year, and debuted at No. 4 in Rivals.com’s Class of 2017 rankings last September. Porter generated national headlines when he threw down a massive dunk during a game with Tolton Catholic last December. Taking off one step past the free throw line, Porter soared through the air, rising over a defender standing in the middle of the lane, before flushing the ball through the rim with his right hand. In June, Porter was ridiculed after he “cut” his list of schools to 17. He explained this week that the list was shorter before he added schools that Young expressed had interest in. Young, who now counts more than 20 scholarship offers, has yet to formulate a list but says he’s tentatively planning to release one either at the end of August or in early September, after consulting with Porter, that includes between 15-20 schools. Though neither player has a firm timetable for revealing his decision, Young mentioned the possibility of staging something similar to Jones and Okafor’s dual-screen announcement in November 2013. At this point, a Young-Porter package deal is not a fait accompli. Asked to assess the probability that it will come to fruition, Young said 80-85%. It’s important to keep in mind that Okafor and Jones were not the norm. Many players have cast themselves as packages, only to later elect to attend different schools. Young and Porter appear to have strong interest in playing together, but remember: they’re just entering their junior years of high school. It’s too early to know whether they’ll still be committed to the concept, say, a year from now. Still, the fact Young and Porter are eagerly discussing the idea of becoming a package should encourage schools who believe they have a shot at landing either player. Getting both would represent one of the biggest recruiting wins in recent memory. • If there’s one recruit from Texas in the class of 2016 that new Longhorns coach Shaka Smart and his staff should prioritize, it’s De’Aaron Fox. The 6’4,’’ 190-pound point guard was among the top performers at the Peach Jam. He’s quick off the dribble and excels at either getting into the lane or pulling up for a jump shots. Fox is also active on the defensive end and does well to apply pressure to opposing ball handlers. In 23 EYBL games this year, he averaged 17.5 points, 5.7 assists and 2.7 steals. Only one class of 2016 player, four-star shooting guard Jacob Young, has issued a verbal commitment to Texas so far. Landing Fox would represent a major recruiting victory for Smart: It would mean that the Longhorns’ new coach kept one of the most coveted recruits in the country away from other high-profile programs located out of state. To get Fox, of course, the Longhorns will need to outbid several other schools, including Kansas, Baylor, Louisville and Arizona. “I’m staying wide open right now,” Fox told SI.com on Saturday. • Ikechukwu Obiagu could develop into a prolific shot blocker. The 7-footer hovers in the paint and deters drivers from launching shots. If an opponent does decide to loft the ball toward the rim, there’s a good chance he’ll swat it into the stands. While it’s clear Obiagu is still in the process of developing an offensive game, he possesses immense potential as a rim protector and also is a capable rebounder. Over five games at the Peach Jam so far, Obiagu has recorded 35 blocks, including seven in Saturday night’s matchup with We All Can Go (Tenn.). Rivals.com rates Obiagu, who currently attends Greenforest Christian (Ga.) Academy, the No. 24 player in the class of 2017. He’s drawn reported scholarship offers from Auburn, Georgia Tech and Missouri, among other programs. • If you watch him for a short stretch, Xavier Simpson may not strike you as a top-tier point guard prospect. He stands 5’11,’’ 165 pounds, doesn’t distinguish himself with exceptional quickness or leaping ability and isn’t a lights-out shooter or a super-skilled scorer from the mid-range. Don’t let any of that distract from what Simpson does do well. He’s a good ball handler and passer who sees the floor well and can offset his size disadvantage with toughness. Simpson doesn’t offer as much upside as some other highly regard players at his position, but it’s not difficult to envision him becoming a more-than-effective starter for a high-major program early in his college career. At the Peach Jam on Friday, Simpson scored a late layup to help King James (Ohio) beat the New Jersey Playaz and posted per-game averages of16.2 points and 4.9 assists over 22 games in the EYBL this year. Simpson has drawn scholarship offers from several programs in the Midwest, including Illinois, Iowa, Purdue and Xavier, and Rivals.com currently rates him the No. 88 prospect in the class of 2016.